Muffins are cute. They don't need to be iced or decorated to look good and are SO easy to make and are SO good if made properly and are SO pretty if filled in cute paper cups and are, I believe, a tad healthier than cupcakes. Well tad or not, I just had to make some today because I came across some very cute and adorable paper cupcake cases and they just made me fall apart. If there is anything that will make me do anything they are flower prints. I would die for them. So it looks like I'll be making a whole lot of muffins or cupcakes for the next few weeks because I now have 192 cute and adorable cupcake cases waiting to be used. That was the smallest pack for sale and being me I just had to buy them. 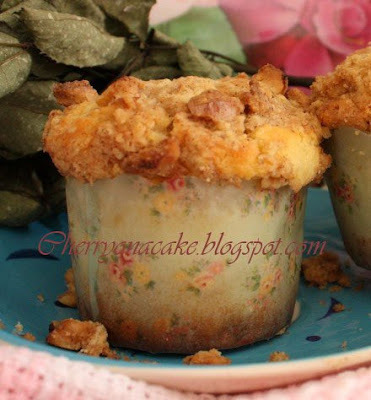 These muffins are very tender, very moist and just nice sweet with bits of apple in every bite. The cinnamon in the streusel topping finishes it off beautifully. Lovely lovely puffin muffins! For breakfast, tea or in between. This recipe makes 8 muffins. Combine all ingredients for streusel and rub in the butter with finger tips until like breadcrumbs. Keep aside. Combine flour, baking powder and salt in medium bowl and mix well. put in the chopped apples and mix a little. In another bowl beat egg and sugar until combine. Pour in milk and mix. Add melted butter and mix again. Add wet mixture to dry mixture and mix with a fork or a spatula. Stir until just mixed and the texture of the mixture looks like curdled or rancid milk with bit o flour still visible. DO NOT over mix or your muffins will be tough because the gluten in the flour would have been activated. Scoop mixture into a muffin tin lined with paper cases until almost full. Top with streusel mixture and bake in 200 C oven for 10 minutes and then turn down the temperature to 180C and bake another 10n minutes. hi Zurin! these look absolutely beautiful and delicious. they look like vintage muffins with that beautiful flower print. these would be perfect for a tea party. love the idea and i will be making these soon. thanks for the recipe. also thank you for your nice comment on my blog. i've been so busy here lately, but i'm back now. talk to you soon. p.s. i really love the floral paper cup idea! Charmaine, Yes very vintage looking I agree! I just love them liners! theyre very fotogenic too. :) Hope u made some muffins. I am a sucker for a crumb topping, these look fab! yay!! you got the watermarks! what'd you use? photoscape? or something less time consuming ? Juli, I used photoshop. This lovely girl from Serbia helped me. She stumbled on my blog then I went to her blog and made comment mentioning about watermark and she sent me complete instructions with pictures on how to do it! so sweet...shes about natalia's age. Her blog is Palachinka n her fotos are beautiful. What PRETTY cupcake cases...192 is sure making me green with envy. What lovely muffins too...YUM!! Your cuppies AND liners are so adorably cute!! I've just made these and they're lovely! I've posted on my blog, please go see. The photos aren't as nice as I'm always baking at night and I have no time to take photos during the day as I'm at work! Anyway, the point is they were delicious, so thank you! Yea! I'm so glad to see your reply on my post. My photos are crappy though, so I suppose I must make another batch of these muffins and take better photos! Bake soon. I love your photos. Very pretty english rose style.